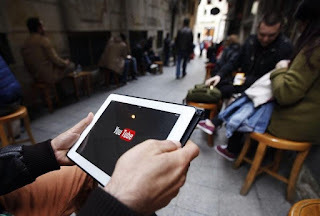 After Google, more people search on YouTube than any other site. "View count manipulation will be a problem as long as views and the popularity they signal are the currency of YouTube." Inflating views violates YouTube's terms of service. But searches for buying views turn up hundreds of sites offering "fast" and "easy" ways to increase a video's count by 500, 5,000 or even 5 million. The sites, offering views for just pennies each, also appear in Google search ads. "The only way YouTube could eliminate this is if they removed the view counter. But that would defeat the purpose of YouTube." Mr Martin Vassilev makes a good living selling fake views on YouTube videos. Working from home in Ottawa, Ontario, he has sold about 15 million views so far this year, putting him on track to bring in more than US$200,000 (S$274,705), records show. Mr Vassilev, 32, does not provide the views himself. His website, 500Views.com, connects customers with services that offer views, likes and dislikes generated by computers, not humans. When a supplier cannot fulfil an order, Mr Vassilev — like a modern switchboard operator — quickly connects with another. "I can deliver an unlimited amount of views to a video," Mr Vassilev said. "They've tried to stop it for so many years, but they can't stop it. There's always a way around." After Google, more people search on YouTube than on any other site. It is the most popular platform among teenagers, according to a 2018 study by the Pew Research Centre, beating out giants like Facebook and Instagram. With billions of views a day, the video site helps spur global cultural sensations, spawn careers, sell brands and promote political agendas. The fake-view ecosystem of which Mr Vassilev is a part can undermine YouTube's credibility by manipulating the digital currency that signals value to users. While YouTube says fake views represent just a tiny fraction of the total, they still have a significant effect by misleading consumers and advertisers. Drawing on dozens of interviews, sales records and trial purchases of fraudulent views, The New York Times examined how the marketplace worked and tested YouTube's ability to detect manipulation. Inflating views violates YouTube's terms of service. But Google searches for buying views turn up hundredsof sites offering "fast" and "easy" ways to increase a video's count by 500, 5,000 or even 5 million. The sites, offering views for just pennies each, also appear in Google search ads. To test the sites, a New York Times reporter ordered thousands of views from nine companies. Nearly all of the purchases, made for videos not associated with the news organisation, were fulfilled in about two weeks. One of the businesses was Devumi.com. According to company records, it collected more than US$1.2 million over three years by selling 196 million YouTube views. Nearly all the views remain today. An analysis of those records, from 2014 to 2017, shows that most orders were completed in weeks, though those for a million views or more took longer. Providing large volumes cheaply and quickly is often a sign that a service is not offering real viewership. Devumi's customers included an employee of RT, a media organisation funded by the Russian government, and an employee of Al Jazeera English, another state-backed company. Multiple musicians bought views to appear more popular: YouTube views factor into metrics from the ratings company Nielsen and song charts including Billboard's Hot 100. Dr Judith Oppenheimer, 78, paid a company $5,000 to promote a book she had self-published in hopes of securing a mainstream deal. Her video soon had more than 58,000 views, delivered through Devumi. "There was no increase in sales and no book deal," she said. "Soon after I signed the contract I thought, 'I'll have no proof of what they do or don't do.' Now it begins to make sense. They can do it in a day." Purveyors depend on constantly evolving tactics to deliver views, including automated or "bot" traffic and pop-under videos on unsuspecting users' computers, but YouTube says it has effective processes to defend against these approaches. "This has been a problem we have been working on for many, many years," said Ms Jennifer Flannery O'Connor, YouTube's director of product management. The company's systems continuously monitor a video's activity, and the anti-fraud team often buys views to understand better how these sites operate, she said. "Our anomaly detection systems are really good." Still, the challenges are significant. At one point in 2013, YouTube had as much traffic from bots masquerading as people as it did from real human visitors, according to the company. Some employees feared this would cause the fraud detection system to flip, classifying fake traffic as real and vice versa — a prospect engineers called "the Inversion." "The problem itself was extraordinary," said Mr Blake Livingston, a member of YouTube's fraud and abuse team at the time who has since left the company. Years later, the battle against fake views continues, even as YouTube contends with disinformation campaigns, like Russia's efforts during the 2016 election, and language it considers hate speech, including posts by the recently banned Infowars site. YouTube would not disclose the number of fake views it blocked each day, but said its teams worked to keep them to less than 1 per cent of the total.Still, with the platform registering billions of views a day, tens of millions of fake views could be making it through daily. "View count manipulation will be a problem as long as views and the popularity they signal are the currency of YouTube," Mr Livingston said. It took Mr Vassilev about 18 months to go from being on welfare and living with his father in Canada to buying a white BMW 328i and a house of his own. By late 2014, his website was on the first page of Google search results for buying YouTube views, fulfilling 150 to 200 orders a day and bringing in more than $30,000 a month, he said. "I really couldn't believe you could make that much money online," he said. The Times reporter's order on his site, for 25,000 views, was fulfilled one day later. A spokesman for Google, which is owned by the same company as YouTube, said that sites selling views appeared in search results because they were relevant, but that there was "room for improvement" in warning users. Mr Vassilev declined to name his clients but said that many orders came from public relations or marketing firms. Today, he fills most orders through SMMKings.com, a wholesale supplier run by Sean Tamir, 29. Tamir charges him about a dollar for a thousand views, which Vassilev resells for $13.99, throwing in 100 free likes. Several times a year, YouTube makes changes to its detection system to try to disrupt fake views, Tamir said. A recent episode came in late January, but many of the sites were functioning a few weeks later when The Times made most of its purchases. Suppliers say they get around system updates by making their traffic appear more humanlike, ensuring that it comes from users with prior views, for example. One purveyor, Mr Carlton E. Bynum II, 24, uses advertising to attract customers. He collected more than $191,000 in revenue this year but spent more than $109,000 in ads that appeared at the top of Google, according to financial records. His site, GetLikes.click, run from a home office in Houston, sells YouTube views as well as Instagram and Twitter followers, Facebook likes and SoundCloud plays. Google does not allow ads with terms like "buy YouTube views." But Mr Bynum said one workaround was to misspell the words and submit an ad multiple times if it was denied at first. When asked about advertising for paid YouTube views, Google removed some of the ads, including Mr Bynum's, but similar ones returned after two weeks. Before Mr Bynum sold views, he was buying them for himself. After he was discharged from the Marine Corps last year, he began posting product reviews on YouTube and taking a cut when visitors made purchases using his links. "It worked great," he said. "I can get views within a day. I can get likes within hours." Mr Bynum said he believed real people were watching his videos. "But let's say there's a small chance I'm wrong and it is bots," he said. "Their videos are still getting ranked." Mr Vassilev, who also said he used fake views to increase the search ranking of videos promoting his website, makes no pretense that what he is selling is authentic viewership. "It's impossible," he said. The salesman on the phone said it would be simple: Professor Elizabeth Clayton, a retired English and psychology professor, could pay Hancock Press $4,200 to publicize her self-published works of poetry. The company said online promotion, including 40,000 guaranteed YouTube views, would translate into sales, emails show. Prof Clayton, 77, was optimistic. She had been publishing for seven years but had not sold much. One royalty check came to $1.47, another to $0.75. She signed up for Hancock to promote two videos, costing her $8,400, records show. "They told me if I got a certain number of hits I would sell a certain amount," she said. Instead of traditional marketing, Hancock paid US$270 for 55,000 views from Devumi for each video, the records show. The views eventually reached about 60,000, where they remain. But there was no increase in sales. "They couldn't tell me anything about the people that were watching the video," Prof Clayton said. "I suspected something, but I couldn't get any information." Mr Wayne Hancock, the 92-year-old chief executive of the Arkansas-based company, said he believed real people were watching the videos. That's how Devumi marketed its views. Hancock's daughter, K.C. Shay, who helps run the business, dismissed Clayton's documents and the Devumi receipts as fakes. But Devumi records show that Hancock Press spent about US$26,000 over three years, obtaining more than 5 million views for 75 or so authors. Interviews with six other Hancock clients are consistent with Clayton's experience. Many Devumi clients came from the music industry, where buying views is common and often seen as necessary. "YouTube is one of the premier sources of music consumption and an important indicator of musical trends and popularity," said Silvio Pietroluongo, a vice president at Billboard. As a new artist, Mr Aleem Khalid hired Crowd Surf, a promotion company, in 2014. Without his knowledge, he said, the firm bought 10,000 views each on three of his videos. They now have between 11,000 and 42,000 views. Others who relied on Devumi said they were similarly surprised at the company's tactics. Mr Ami Horowitz, the conservative filmmaker, bought 10,000 views for a video he appeared in — "What We Learned at the People's Climate March" — on the YouTube channel for Americans for Prosperity, the Koch brothers' political influence group. Mr Horowitz, who is often a guest on Fox News, also bought views for a video about the protests in Ferguson, Missouri. In a statement, he said he had believed Devumi worked like traditional web advertising. But "it wasn't what we expected," he said, adding that he never used Devumi or similar services again. A spokeswoman for Americans for Prosperity called the behaviour unethical and said the group would "not knowingly engage" in it. YouTube's engineers, statisticians and data scientists are constantly improving in their ability to fight what Ms O'Connor calls a "very hard problem," but the attacks have "continually gotten stronger and more sophisticated," she said. Even when it looks closely, YouTube can miss videos with fake views. A 2017 Google public report on disinformation during the 2016 election looked at RT's YouTube channels, concluding that there was "no evidence of manipulation of our platform or policy violations." Yet The Times recently found that an RT employee bought fake views for videos in 2016, which YouTube acknowledged it did not detect. Mr James Brown, a correspondent for RT, had purchased 30,000 views and 300 likes across three videos that focused on problems involving homelessness and immigration in Europe. Mr Brown said he took Devumi at its word that the views would be real people. An RT spokesman said the company was unaware of the purchases and was conducting an internal review. "It concerns me that while Twitter and Facebook appear to have made some credible progress in this area, YouTube still struggles to identify inauthentic and coordinated activity on its platform," said Senator Mark Warner of Virginia, the top Democrat on the Intelligence Committee. "The only way YouTube could eliminate this is if they removed the view counter altogether," said Mr Vassilev, the fake-view seller. "But that would defeat the purpose of YouTube."